Whether it’s a father, grandfather, or boss, sometimes men can actually be quite difficult to shop for. Sure, they can say that socks are just what they need, but trust me, they don’t want socks for Christmas. They just don’t. They want something that makes them look cool – something that they can tell their friends about and their friends will say, “That’s serious!” If you want something seeerious, then check out CAMUS Cognac Gift Sets. A special cognac, perfect for the most memorable moment of the holidays – a romantic dinner, a toast to the guest of honor, or a romantic interlude by the fire. For this year’s holidays, the CAMUS family introduces the highly anticipated Borderies XO gift set, in addition to the CAMUS Elegance Holiday gift set range comprising VS, VSOP, and XO cognacs. Each CAMUS Cognac Gift set includes two special glasses – from small rocks glasses to crystal tulips in addition to a nice bottle of CAMUS Cognac. VS, VSOP and XO differentiates between the types of cognac CAMUS offers in their cognac lines, each with their own distinct flavor and personality. We sampled the CAMUS VSOP Elegance gift set, which included two small rocks glasses. The bottle of CAMUS is generous (750mL) and is a simple yet classy design. The rocks glasses are smooth and clean with a small CAMUS logo on one side. The CAMUS Cognac gift sets are definitely gifts that will be appreciated and enjoyed, and if the gift recipient is generous, enjoyed with their friends. CAMUS Cognac Gift sets range in price from $26 to $150. 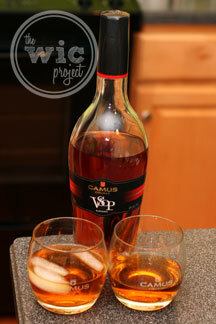 We found CAMUS VSOP Elegance gift set reasonably priced at $36.79 from The Party Source.